The New York Times carried an article by Choe Sang-Hun and David Sanger titled "As North Korea Blusters, U.S. Worries about Quieter Risks." It reinforces some of the points made in my last post. I only have one question. In what sense are the cyber war attacks and propaganda a "quieter" risk? It seems to me that their effects are noisy and very real. I've observed with considerable interest the cyber war that is taking place these days in Korea. I use "cyber war" here with reference not only to malware and denial of service attacks, but also to the "war of words," in official statements of the North Korean and other governments, and also YouTube videos. Just as many of the founders of the modern field of communication research studied propaganda during World War II, what we are witnessing today is a form of propaganda and information warfare. The new element is that the war is taking place in cyberspace. Initial reports of the cyber attacks that disrupted several major South Korean banks and broadcasting organizations traced them to Chinese IP addresses, but it is not so easy at all to track down the original source of such attacks, given the inherently decentralized structure of the internet. 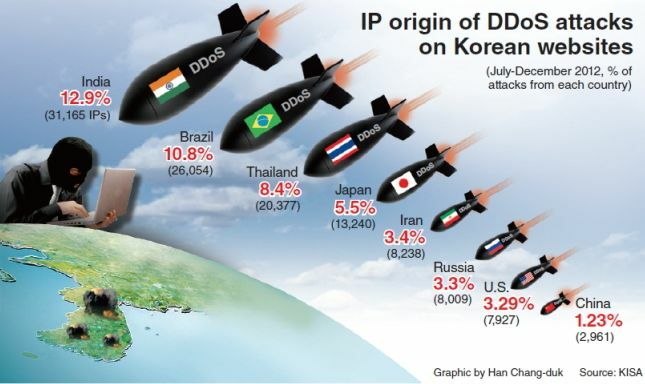 A study released by the Korea Internet and Security Agency ranked the top countries of origin for DDoS attacks as shown in the accompanying graphic (click on the graphic to see a full size version). During the last six months of 2012, India, Brazil, Thailand, Japan and Iran were the top five sources according to IP addresses. In addition to the cyber-warfare that targets businesses and their administrative networks or websites, the latest skirmishes have also involved a "war of words" and other symbolic gestures. In recent days, North Korea has made repeated public announcements about the specific state of its military readiness and these, not surprisingly have been covered by most major news media around the world. South Korea and the United States have responded with gestures that have included nuclear submarines and stealth bombers taking part in joint U.S.-ROK military exercises. Also, North Korea is more frequently using its YouTube channel for distribution of videos, such as the following one, published widely by media around the world. As promised, this post contains some additional details on the new mega-ministry which is being called the Ministry of Future Planning and Science in many English papers (미래부 or "Future Ministry" is the shorthand reference being used in the Korean press). The following details come from an article in yesterday's Joongang Daily (Korean language) and another that appeared in The Korea Times today. The new Ministry will be very large, and is referred to as "mammoth," with more than 800 staff members at the start, about 300 of whom will be transferred from the Korea Communications Commission and another 250 from the current Ministry of Education, Science and Technology. The "Future Ministry" will have two Vice-Ministers. One will oversee future planning research and science and technology policy. The second will be in charge of broadcasting-telecommunications convergence, frequency allocation strategies, telecommunications policy and broadcasting promotion strategy. It will have responsibility for the allocation of approximately 17 trillion Korean (over 15 billion U.S. dollars) won in national research and development funding. This was formerly controlled by the Presidential National Science and Technology Council which is being abolished. It is envisioned as a giant engine to foster the creative economy promised by President Park Geun-hye by fostering contents--platforms--networks--devices (CPNT) and promoting the ICT industry. Notably, it brings the ICT policy responsibilities that had been scattered among several ministries back into one place, with the exception of telecommunications regulation by the KCC. Key responsibilities that were formerly under the Ministry of Culture, Sport and Tourism are being transferred to the Future Ministry. These include promoting the circulation of high quality, authentic digital contents, core technology development, database industry development, growth projects for SMEs and the digital contents platforms business. As noted in The Korea Times, "In her inaugural address on Feb. 25, Park defined a creative economy as the convergence of science and technology with industry, a fusion of culture with industry and the blossoming of creativity across industry sector borders." Over the weekend, ruling and opposition party negotiators reached an agreement which, if approved by the full National Assembly in a vote this week, will confirm the rest of President Park Geun-hye's government reorganization plan, including its centerpiece, the Ministry for Future Planning and Science. As reported by the Korea Joongang Daily, "The agreement came 47 days after the bills were submitted by the Saenuri Party to the Assembly and 21 days since the Park administration began. “President Park expressed her appreciation to the National Assembly for reaching an agreement on the government restructuring plan,” said Kim Haing, a Blue House spokeswoman. “She also said the government and the ruling and opposition parties should cooperate to empower the Ministry of Future Planning and Science to revive our economy and create jobs.” "
A key issue that held up approval of the government reorganization was the claim by the opposition party that formation of the new super ministry would be used by the Park Geun-hye administration to control broadcasting. That issue was solved by agreement to set up a special comittee on broadcasting. As noted in the Korea Joongang Daily article," To ensure broadcasters’ neutrality, the ruling and opposition parties agreed to establish a special committee on the issue in the March legislative session. The committee will be composed of an equal number of members from the Saenuri Party and the DUP. It will be chaired by the opposition DUP during its six-month term." More on the specifics of the new Ministry in later posts. The political impasse over President Park Geun-hye's government reorganization continues, as does public discussion and mainstream news media coverage of the issue. For example, an article in The Korea Herald carried the headline "New Giant Ministry Mired in Political Wrangling." An article in The Korea IT News covered a meeting of scholars hosted by the Korea Federation of Science and Technology Societies on March 5. Some of the experts in attendance pointed out that the Ministry of Future-Creation Science (English name to be decide later) must lead convergence and support the creation of an ecosystem for producers of intellectual property (IP). Professor YI Park of the Digital Media School, Ewha Women’s University, suggested that intellectual property should be used as the tool for convergence. “It is widely understood that there is science and technology on one side of the Ministry, and ICT on the other side. We need a successful convergence technology package that will bridge the two sides,” commented Prof. Park. Super-ministry nominee withdraws, his "dreams shattered"
The Korean-American entrepreneur and former President of Bell Labs who had been nominated by President Park Geun-hye to head the new Ministry for Future Science and Innovation (my translation as the official name has not been announced-- 미래창조과학부) today withdrew from consideration. As reported in The Korea Joongang Daily, Kim Jeong-hoon, the nominee, told a news conference at the National Assembly in Seoul, "As I watched the confusion over the government reorganization bill, my dreams were also shattered." I've been interested for some time in the origins of the "information superhighway" metaphor and how it took root in Korea shortly after Vice President Al Gore used it in a 1994 speech at UCLA. (e.g., see this earlier post) However, I've recently become aware of information that sheds additional light on the power and popularity of the information superhighway metaphor, especially here in the Korean context. First, my colleague Professor Chihyung Jeon published an article in Technology and Culture (January 2010, Vol. 51), entitled "A Road to Modernization and Unification: The Construction of the Gyeongbu Highway in South Korea." 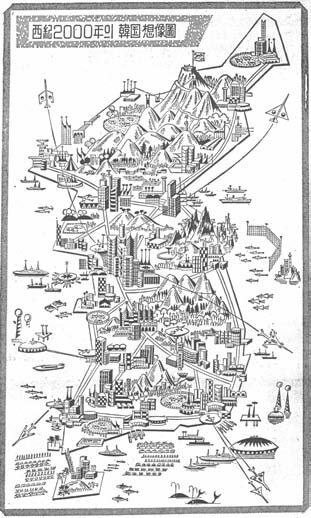 His article included "An Imaginary Drawing of Korea in the Year 2000" from the Dong A Ilbo, January 1, 1970 (shown at left). Professor Jeon's research explains how President Park Chung Hee, and the Dong A Ilbo newspaper, used the metaphor of the new highway, Korea's first expressway, to symbolize the dual challenges of economic development and national reunification. Jeon notes that, in terms of economic development along, the Gyeongbu Highway became a symbol of the "Miracle on the Han River," as South Korea's post-war economic boom became widely characterized. However, instead of focusing on the economic impact per se, his essay zeroes in on the manner in which this famous highway became such a powerful symbol in the nation's recent historical memory. The full article can be accessed through Project Muse or via the journal online. I highly recommend it. The second piece of new information came by way of yesterday's Hankyoreh newspaper, in an article which showed up when I did a Google this morning search for "미래창조과학부," the proposed new Ministry for Future Science and Innovation (my translation--the government has not yet announced the official English designation for the ministry, nor has it received the necessary stamp of approval by the National Assembly). The Hankyoreh article (Korean language) basically argues that President Park's tenacity in insisting on approval of the new Ministry for Future Science and Innovation is because, upon close examination, such an "ICT expressway" forms the foundation for realization of the "creative economy" one of her major campaign promises, and also the "second miracle on the Han River," that she invoked in her inaugural address last week. The article quoted the presidential spokesman who explicitly compared the challenges faced by the proposed new ministry and the Korea Communications Commission to deal with cable, IPTV, satellite and other means for content distribution with the role played by the Gyeongbu expressway back in the mid-twentieth century industrial era. "In the old days" according to the spokesman, the expressway stimulated the building of nearby factories and the distribution of new goods and services. Even more specifically, the spokesman noted that just as President Park's father had utilized the Gyeongbu expressway project to create the first "Miracle on the Han River," the new president views the ICT superhighway as a core component of her plans to create a second miracle on the Han. Metaphors play an important role in politics and in the public promotion of policy all around the world, and Korea is no exception. For Koreans, the Gyeongbu expressway is a powerful political symbol and metaphor, which contributes in interesting ways to the influence of the newer "information superhighway" metaphor. This post only begins to suggest some of those ways.